The men apparently thought that the women’s tale of a risen Jesus was nonsense, “an idle tale,” and “they did not believe them” (Luke 24:11). This is not surprising: women in that culture were generally considered too emotional or too illiterate to be valid witnesses. For this reason, it is all the more striking that women were the key witnesses to the heart of the later Christian creed, for they were last at the cross, first at the tomb, first to hear the Easter message, first to see the risen Lord, and first to proclaim the Easter message. In this very interesting work, the author seeks to disband the onrush of recent infatuation with non-canonical literature (as he will do), but it was this chapter focused on Joanna and the lady from Migdal that caused me to pause and offer a bit of it to you. Well, you know, with my vested interest in parakeets and all. It is taking leaps beyond my usual allowance, but is none the less worthy of unloading before your gracious audience. Who knows, someone may offer something to lessen my seeing the author’s stretching a bit here. Cutting to the chase, the author sees a very real possibility that the Joanna of Luke’s account of the gospel (8:3) is the Junia of Paul’s letter to the Romans (16:7). First, according to the author, this suggests Joanna was a disciple of Jesus (remember what you were taught). She, just as the lady Magdalene and others, were nurtured by Jesus and followed him (there is additional evidence of this). Second, from Paul’s words to the church in Rome, he considers Junia his kin, as in she is a Jew. Joanna and Junia are similar names but were found given most frequently to citizens of differing lands; Junia as a Roman name and Joanna as a Hebrew name. Then, there is the acknowledgment that Junia was in Christ before Paul. Considering that Paul was rescued on the road to Damascus just a short time after the crucifixion of Jesus, this means that Junia may very well have been an eye-witness to the resurrection of Christ; hence, the argument many make for her being an actual legitimate apostle with a capital A. Most importantly, this author shares, is the descriptive way Paul refers to Junia, “notable, prominent, outstanding among (this term, “among,” is defined in detail by the author) the apostles.” Both Origen and Chrysostom, the suggested earliest Greek commentators on this verse, agree with the author’s understanding here. In sum, Paul is writing about a Jewish woman called Junia (but presumably named Joanna in Hebrew) who was an early, close, and prominent follower of Jesus, who witnessed Jesus’s resurrection, and who then boldly spread the gospel. There are hurdles though for the making of them one, such as the husband of Joanna, Chuza, and assuming Andronicus was Junia’s husband’s name in Rome. The author has his way of rationalizing this but I’ll leave that for you to purchase and read for yourself (hey, I’m supposed to be convincing you to read these things I delve into, not rewrite the author’s books). Once again, this is not the primary intent of the author, to defend the role of women in ministry. His, as stated, is to tone down some of the recent buzz such as Jesus and his relationship with one of the Mary’s (Scripture depicts them as teacher and student), and the really Gnostic influence of works like the gospel attributed to Thomas. Still, whether they are two women or one, this really opens an entirely contrary avenue of discussion regarding the role of women in ministry. Which, with a little open-mindedness and a willingness to let others share, isn’t a bad thing at all. This entry was posted in Blue Parakeet, Books and tagged Ben Witherington, blogging, Christianity, Jesus Christ, Mary Magdalene, Religion and Spirituality. Bookmark the permalink. 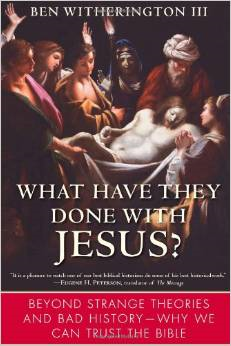 4 Responses to What Have They Done With Jesus? This whole question of women and their believability because of their lack of education. Remember the Jewish system required all people to know the written code of the law so they were orally taught and the levels of educated literacy were higher – it was one reason for the spread of the Jews in trade because all family members would learn a measure. But remember when the Apostles were call unlettered or illiterate it was a comparative based on their lack of education. Strangely in the UK we coming up to 100 years of universal freedom to vote for men the key point up to 1918 had been that rural communities were illiterate therefore they need not be asked to vote. They were not called as witnesses in court cases or were deemed to be less believable. The person you describe here had been taught by Jesus, had travelled with Paul and obviously was well known in the congregation so she would have been an outstanding character to know. Yes, we also endured a spell of our American history similar to as you describe. Times have definitely changed, and in many ways, much for the better. Thanks for the great comment and the encouragement!